I strongly believe that opportunities do not come to those who wait for them and I feel it is this principle that has guided me forward till date. I seized most of the opportunities that came my way and gathered courage to swim across the ocean of life all alone deriving new energy and strength from the hurdles I often tumbled upon. Failures hardly discouraged me right from my school days and instead, they left me with new experiences that prepared me better for the next level of struggle in life. I lost my sight at the age of nine due to some ocular infections and that marked the actual beginning of my conflict with life. Yet, I now feel I have somehow managed to get to the brighter side after several years of struggle. So the tapestry of experiences I have woven over the past thirty-four years has made me realize that after all, life is not a cup of tea to be sipped in one breath. To be successful in life, one has to be well determined, optimistic and prepared to face any type of challenge. Today, people see me as a comparatively successful man with a stable family at home and a secure job in the office but it doesn’t mean that I have achieved everything. I still have a long way to go and I know as I move on, I will have to overcome several other obstacles but whatever I do, I don’t easily give up and I feel such should be the spirit if one has to achieve success. I am currently working as a counselor for Youth Center Division, Department of Youth and Sports, Ministry of Education where I am responsible for looking after counseling, guidance and information services. In addition, I am also helping the Management organize and conduct youth programmes and activities in different Youth Centers in the country at regular intervals and that gives me additional opportunities to gain new experiences and knowledge. Moreover, the advanced technology has made it possible for us to work comfortably on the computer with the help of a screen-reading software called JAWS (Job Access With Speech) which reads anything that appears on the screen. So now with almost everything made possible by science and technology, I no longer feel the pinch of being blind. Despite visual impairment, I am glad that I am able to make my own share of contributions to the society like anybody else but how I reached this level is not a miracle. Rather, it is a story of strong determination and willingness that have helped me cut my way through the wilderness of time so far. I come from a remote village of Dipujora, Chengmari, Samtse where I spent eight years of my childhood in extreme poverty. My family being landless had to basically survive on share-cropping system and most of the time, my parents had to work for extra hours in order to keep the oven burning. So I must say I was put through the ordeal of life right from my early childhood and as I progressed in age, I began to develop thicker skin. Sometimes, I feel what Shakespeare has said is absolutely true: “When miseries come, they come not in a single spice but in battalions” because I fell into the chain of misfortunes one after another. I lost my mother to tuberculosis when I was barely four and that left me in more pathetic situation. My father however remarried as I needed to be taken care of at home while he was out but my step mother too died of the same disease four years later. Then when I had just turned nine, an eye epidemic struck our vicinity and left me blind after a few weeks of severe ocular illness and almost at the same time, my sister and younger brother passed away due to pneumonia leaving me alone with my father. I was however taken to Zangley Muenseling School for the Blind, the present-day Muenselling Institute in Khaling under Trashigang district in 1990, a year after I lost my sight. Again in November of the same year, my father suffered a mild brainstroke that left him partially paralyzed, and that left us with no option but to club ourselves with the family of my paternal uncle in Samtse who himself had four children to support with his meager monthly income. However, whatever sufferings and miseries I was subjected to by circumstances compelled me to work hard and in the process, I could develop self confidence to carry life forward on my own feet. No matter what problems kept pricking me but I never gave up in studies because right from the beginning, I was well convinced the importance of education. 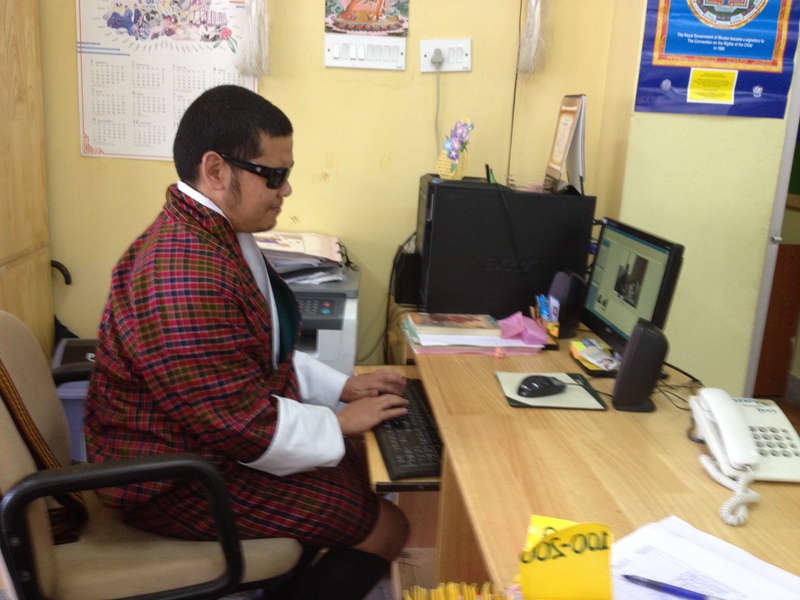 I realized very early that being visually impaired, education could be the only means of livelihood. So I worked with all seriousness and commitment to excel in academic performance throughout my school days and as expected, I successfully got through all levels of examinations. Upon the completion of class XII in 2001, I was fortunate to be selected for 3-year BA English Literature in Bharatiyar University, Tamilnadu, India under RGOB scholarship in 2002 and in the college too, I kept the same spirit. Of course, I had to work harder than the rest of my colleagues because of the lack of materials in Braille but my 3 years of consistent hard work was well rewarded at last. I stood first for all 3 years and I was awarded a gold medal during the Annual Awards Day in May 2005. In the same year, I sat for the Civil Service Common Examinations and once again I was lucky to get through with fourth position out of 329 graduates who had done the exam. Then I did PG Diploma in Public Administration for one year in RIM and joined the current job in January 2007. In 2010, after having served for four years, I realized that it was time for me to look for opportunities to upgrade my professional knowledge and decided to apply for Endeavour Award, a scholarship programme offered by Australian government. I subsequently applied for the award but I couldn’t be lucky enough to get the scholarship. Even then, I didn’t give up and re-applied in the following year and this time, I was fortunate enough. I got the scholarship to undertake Masters of Counselling at Curtin University in Perth, Western Australia from Jan 2012-Dec 2013. So now I am back to my profession with Masters degree, which means, back with greater confidence and more skills to work with young people. In the span of these many years, I personally got a lot of practical lessons out of my own experiences and I feel a sense of relief that I have been finally able to move with time. I have realized that whenever any crisis engulfs us, sitting back and shedding tears won’t help. After all, life has to go on and we have to get back to the normal routine. One important consolation when tensions bother us is the fact that nothing is permanent as HG Wells has rightly said, “Today’s crisis will be tomorrow’s joke”. One day or the other, we will be done away with whatever problems we are faced with but how fast we want to push them aside depends on our determinations and commitment. So to conclude, I am of opinion that if one is well determined, optimistic and confident to move towards the goals set in life, the secrets of success need not be sought anywhere else.